St Augustine begins by reminding us that in his compassion, Christ sees that the hearts of his disciples are troubled, and St Cyril of Alexandria, who also comments on the tender heart of the Lord, tells us that in telling them not to be troubled, Christ offers his mercy to them in their weakness and their human frailty. Peter had declared that he would never betray the Lord, but Christ knew the hearts of men better, and he sought, Chrysostom writes, to reassure them that the mercy of God was more powerful than the darkness of the despair which was coming. Jesus, St Cyril says, makes soldiers out of ‘recent cowards’; cling, he says, to the power of faith, for it is a weapon whose blade is stout and broad; suffering will come, of this we can be sure, but let us not fear that the evil one can triumph; he cannot; Christ is risen. St Hilary of Poitiers points out that here the Lord demonstrates his unity with the divine nature, whilst also distinguishing his person as the Son in the Holy Trinity. St Irenaeus reminds us that God has prepared all things from the beginning; each has been allocated a place Augustine tells us that in preparing the dwellings, God is also preparing us to be fit occupants of them. All these mansions will be filled, St Gregory of Nazianzus, writes, for the grace and mercy of God are as beyond our comprehension as the stars are above the earth. As Theodore of Mopsuestia comments, ‘with my Father there is such an abundance that he can give everyone the delights of eternal happiness.’ Christ, St Cyril says, points the way to these heavenly mansions, and we come to them through him alone. But he will leave, Augustine comments, his disciples here in order to elicit faith, which would not have been possible (or necessary) had he remained in the world in the flesh. He is coming again for them and for us because he is life. St Thomas’ comments shows, Augustine tells us, how much the disciples did not know that they knew. Leo the Great reminds us that if we follow the Cross, we follow Christ who is the way, the truth and the life. We come to God through God, Chrysostom says, although the disciples did not yet clearly see this. We must, Augustine reminds us, walk by faith in the truth that is Christ, so that we shall one day know the whole of that truth. St Cyril tells us that the Lord is the life because he alone can restore to us the life of incorruptibility that we hope for and which we were made; Christ is the immortality which he gives to us, as St Gregory of Nyssa reminds us. No one, St Hilary comments, can come to the Father except through the Son, nor can any partake of the divine nature apart from the meditation of Christ; this St Cyril emphasises, instructing us that it is through practising every type of virtue, through faith in right doctrine and by hope in the life to come, that we shall be sustained. In Him alone must we trust. 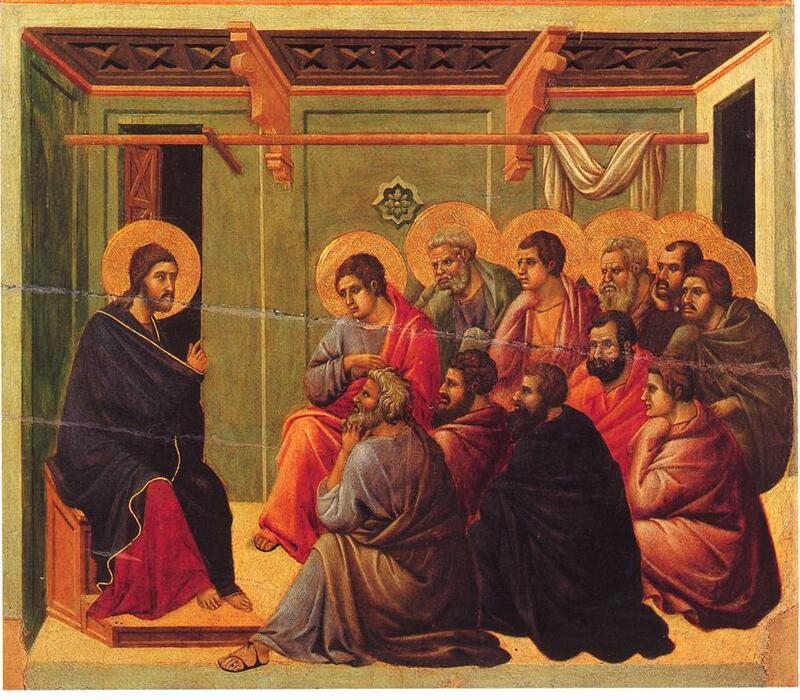 In this discourse, Christ reveals to us his knowledge of who he is. But it is not, St Hilary tells us, Christ’s human nature which makes the Father known to us, but rather his divine nature. The disciples know, Chysostom says, something of God, but they did not yet know him as the Father; St Philip fails to understand what Christ has been telling them, that the Father is seen in him, because he does not yet have what Augustine calls ‘the eye of faith’. The Old testament tells us that no one can look upon the face of God and live, but Christ is the perfect divine image of the one who begot him before all worlds; it is the will of Christ and the will of the Father which are one, as St Basil reminds us. But we are not to think, as St Hilary instructs us, that we can understand the mutual indwelling of the Father and the Son; they are of one substance, but they are two persons, and we must not suppose that at one moment the Father is the Son or the Son the Father; one may speak through the voice of the other, but that, St Cyril reminds us, is because their will is perfect union. All three persons of the adorable and blessed Trinity are. Augustine reminds us, one in their will and actions; as the image of the Father, the Son shares his attributes, as St Athanasius comments.We cannot have that same unity, although we can be adopted as sons. Our very believing is the work of Christ himself, and if we go to Him, we go to the Godhead. We are granted what is best for us, which we may not know with the certainty that God alone has; He alone is all-wise and compassionate. St Cyril of Alexandria writes that whilst the men on the Emmaus road are not among the remaining eleven Apostles, they may well be among the seventy commissioned by Jesus. St Ephrem the Syrian tells us that Jesus’ identity is hidden from them, just as the light of his resurrection is still hidden from most of the world. 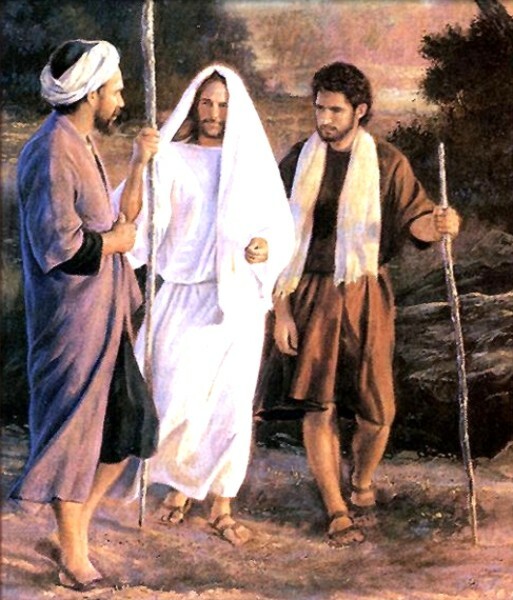 St Augustine comments that the disciples were walking along, grieving for him as though he were dead; they still needed more catechesis – which Jesus will provide. They seem, according to their words, to lack hope and their faith seems dead; they saw, but they did not recognise him; only in the breaking of the bread will they do this. The tradition of the Church, as told to us by Eusebius,, is that Cleopas is Clopas, the brother of Joseph, and therefore the uncle of Jesus, and that the unnamed disciple is his son, Simeon, later the second bishop of Jerusalem; tradition has it that he, too, died a martyr’s death. St Augustine explains to us the Christology of the Emmaus disciples. They doubted when they saw Jesus crucified. They confess their despair and doubts to him, showing that, like Moses, they do not fully understand God’s purposes. St Cyril tells us that the Emmaus disciples who are scandalised by the Cross need to become like the penitent their, who saw that, through the Cross, he might enter into the kingdom. But they need Jesus to open up the Scriptures to them, so they understand that he needed to suffer and to die. They kerygmatic passion and resurrection formula are supported by the scriptural foundation given by the risen Lord as he interprets for them what was hidden. The whole of the Old Testament is Christological, for every thread and theme leads to the crucified and risen Christ. St Ephrem points out that Jesus knows them in the breaking of the bread. The meal is, as St Augustine tells us, pivotal because it continues Jesus’ pre-resurrection table fellowship of Easter through the sacrament. Jesus continues to reveal himself in the bread and wine we share at the Eucharist. He disappears from them now, and he will be possessed by faith in word and the meal. We experience burning hearts from the word of Jesus. As Ambrose tells us, the wins of fire that create burning hearts in the disciples are the flames of the divine scriptures as Jesus interprets them. Faith goes on to create the fires of charity that now reigns in their hearts. How like those disciples we are so often, and we need to make sure that we keep hearing his word and keep breaking the bread of fellowship with him. We are are all on that road, and let us help each other to see what he showed them. Theodore of Mopsuestia points out that the need to go through Samaria gave Jesus an opportunity to to teach the disciples a lesson. Although the Samaritans and the Jews were estranged, Jesus showed that He was sent to save everyone, not just the Jews. Samaria received its name from Somer, a mountain near by. The inhabitants had originally been Israelites, but they were deported to Babylon, and when they returned they found that barbarians had settled there. That Jesus was weary is, St Cyril and St Ambrose note, a sign of the reality of the Incarnation; it was also a sign that the lack of faith of the people was a cause of weariness. St Augustine thinks that the Samaritan woman at the well mystically signifies the church of the Gentiles which approached him. He asks for a drink because he thirsts for her faith, and for that of the world. St Ephrem says that like any good hunter, he had sent his disciples away lest they scare off the woman. Theodore and Chrysostom note that the woman pays due regard to custom and the law in her initital refusal. As Augustine notes, the woman would have been surprised since Jews did not interact with Samaritans; but as Jesus is the fulfilment of the law, he can, as Chrysostom points out, talked to her because the old law no longer applies. Eusebius reminds us that Zechariah prophesied the living water of the Gospel would come forth from Jerusalem; Jesus is the fulfilment of that prophecy to the Samaritans. Living water is not stagnant, it gushes out as the Spirit of Christ for our eternal life and that of others; it waters our parched human nature, St Cyril writes. Not everyone knows the gift of this living water is to be found in baptism, otherwise none would delay in receiving it. Chrysostom comments on the way the woman continued her conversation with him reverentially, calling Jesus Lord; but she still does not understand the implications of the iving water of which he speaks; those who drink deeply will receive the grace of the Spirit, which is eternal life, as Ambrose reminds us. 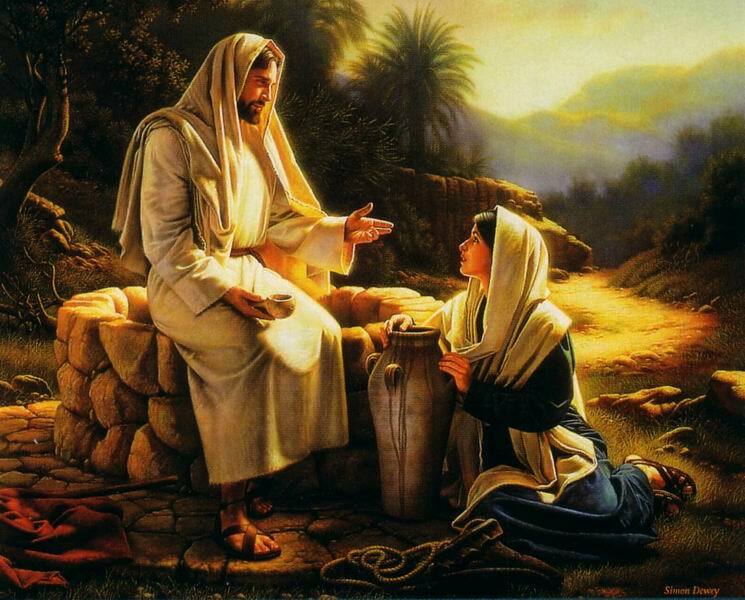 Jesus tells her of water that not only satisfied thirst, but that is a source of perpetual refreshment. Augustine writes that the living water of Christ satisfies our spiritual thirst as the pleasures of this world never will; one who has the grace of the Spirit welling up in him will never be thirsty, St Cyril comments. The Samaritan woman is more receptive of his message than was Nicodemus; she begins to show him more honour even than the patriarchs of old. Augustine notes that Jesus is inviting her to stop working so hard and instead, to receive nourishment from him. Origen sees her admission that she has no husband as a form of confession’ Jesus’ request exposes her guilt, as she is involved in an illicit union. Christ calls for faith from the woman and leads her to a higher understanding. He speaks, St Cyril tells us, of a place of future worship which will not be bound to any single place as the dwelling place of God, but will be built on the living stones of the Church. Salvation is from the Jews, Augustine writes, but it is not confined to the Jews. God is adored not in a place but in the Spirit; those who worship the Father in the Spirit ultimately worship the Trinity. Origen tells us that Jesus identifies God as Spirit here to distinguish him from corporeal beings, since God is by nature incomprehensible and unlimited. True prayer can take place only through the Spirit, and those who no longer fulfil the desires of the flesh walk in the Spirit and thus worship Him. Augustine points out that the woman, like all Samaritans, looked forward to the coming of the Messiah, but it was only at this moment that she realises who Jesus is. Her confession of sin was the first signs of the Grace that was stirring within her. Although the disciples were amazed at Jesus’ treatment of her, she was, as Origen comments, made in the image of God as much as the next person. St Cyril points out that Jesus sets an example of how one should treat women with respect. Augustine points out that as she returns she leaves the water jar behind because she has the loving water within her. She returns as an Apostle who speaks to all of what has been revealed to her. All of this she does, Chrysostom points out, without any concern about how her former life might be regarded. St Cyril tells us that her exuberance follows the example of Jesus, who neglected food in his zeal for the Church. He tells his disciples about a food from God of which they know nothing; but as with the woman about the water, they understand only on the surface. Chrysostom notes how he explains to his disciples that his hunger lies in the desire for our salvation – which is his real food to us. God’s will is that all should repent and be saved. Jesus instructs his disciples to lift up their eyes so that their thoughts may be focused on what God wants to accomplish. Chrysostom tells us that the fields that are white for harvest are the multitude of souls prepared for receiving the preaching of the Gospel. St Cyril tells us that the harvest will be reaped by the glittering and sharp words of the Apostles, who then bring their harvest to the floor of the Church. Origen comments on how Jesus stays with the Samaritans so that all may benefit from his word. We are not told what Jesus said to them, but we are told that many were converted and followed him. From this time on, we see that His words are meant for the salvation of all who will come to Him.